No matter where the roads of Lee’s Summit, North Town, and Overland Park take you, it’s important to be equipped with a trustworthy ride that’s adorned with all your daily necessities. Well, inside the 2018 Volkswagen Passat and the 2018 Ford Fusion, you’ll find all the cabin comforts, performance essentials, and fuel efficiency required for a productive day. Of course, only one of these stylish sedans can earn a spot in your driveway. That’s why we’re here to help you choose the right one for your lifestyle with this 2018 Volkswagen Passat vs. Ford Fusion vehicle comparison created by Volkswagen Lee’s Summit. Before long, you’ll be traversing the roads of Mission and Olathe inside a vehicle that’s ready to tackle your busy schedule. Every moment you spend inside your vehicle should be equipped with a hefty dose of strength that helps you surge along your path with ease. Fortunately, both the 2018 VW Passat and the 2018 Ford Fusion come with powerful engines that provide you with the right amount of muscle for any journey. The 2018 Volkswagen Passat offers up a standard 2.0-liter turbo motor, which creates 174 horsepower and 184 lb-ft of torque. The 2018 Ford Fusion features a standard 2.5-liter engine that produces 173 horsepower and 174 lb-ft of torque. Without the improved capabilities of the VW Passat, you may find a ride inside the Ford Fusion to be a bit less spirited than you’d prefer. While your sedan is churning out serious power on the highway, you want to be sure that it’s also working hard to preserve the fuel in your gas tank. Well, the 2018 VW Passat serves up a fuel-sipping mindset that’ll help you steer clear of filling up on gas too often. Unfortunately, the 2018 Ford Fusion doesn’t quite match the efficiency of its Volkswagen competitor. The 2018 Volkswagen Passat aligns with your environmentally friendly mindset with an EPA-estimated 25 MPG city and an EPA-estimated 36 MPG highway1. The 2018 Ford Fusion falls short of the VW Passat, offering an EPA-estimated 21 MPG city and an EPA-estimated 32 MPG highway. Visibility is the key to an informed drive. And, inside the 2018 Volkswagen Passat, you’ll easily see all the entertainment options and infotainment conveniences from the standard 5-inch touchscreen. Once you press the main menu, you’ll effortlessly access the handy tools contained within the Composition Color infotainment system, such as Bluetooth®. Thanks to this intelligent gadget, connecting to your contacts and music is as simple as speaking a command. On the other hand, the 2018 Ford Fusion provides you with a standard 4.2-inch touchscreen and SYNC® infotainment system. Without the larger display included inside the VW Passat, selecting your favorite feature while driving may prove to be a bit more difficult. Now that you’ve had a chance to check out this 2018 Volkswagen Passat vs. Ford Fusion vehicle comparison, there’s no doubt that you’ve got your heart set on your perfect automobile. So, for stepped-up performance, improved efficiency, and user-friendly technology, make sure you begin your next journey near Lee’s Summit, North Town, and Overland Park inside the 2018 VW Passat. 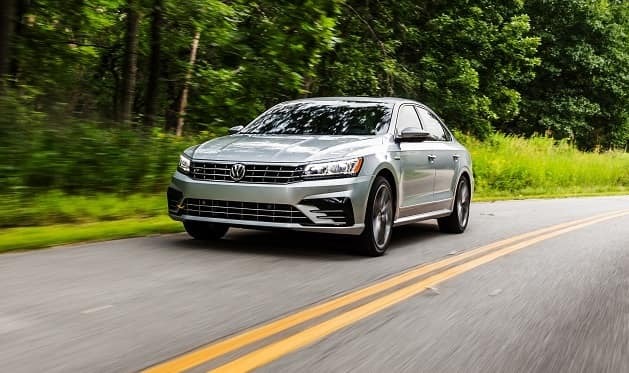 To get a closer look at all the thrilling amenities included inside this reliable ride, don’t hesitate to stop by the showroom at Volkswagen Lee’s Summit or schedule your test drive today! We’re always ready to assist drivers near Mission and Olathe in your search for the ideal car. 125 city/36 highway MPG (2018 VW Passat 2.0L, 6-speed automatic transmission). EPA estimates. Your mileage will vary and depends on several factors, including your driving habits and vehicle condition.